Step 1. Make your pancakes and keep them in a warm place. Step 2. Place marscapone in a bowl and blend in half of the strawberries. Taste and add brown sugar if required. Step 3. 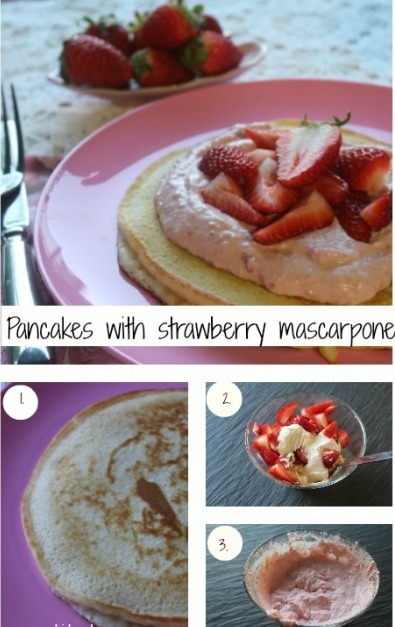 Spread strawberry marscapone on each pancake and top with remining fresh berries. I used a stick mixer to combine the marscapone and strawberries but you can just mash it together with a fork for a more rustic presentation. The brown sugar in this recipe is optional. Taste your mixture first and then add a touch of sugar to balance the flavours if you desire.